Join Rhonda Camp Warren for her first ever Open Studio Event. If you’re still looking for some creative gifts, this is the place to find them. 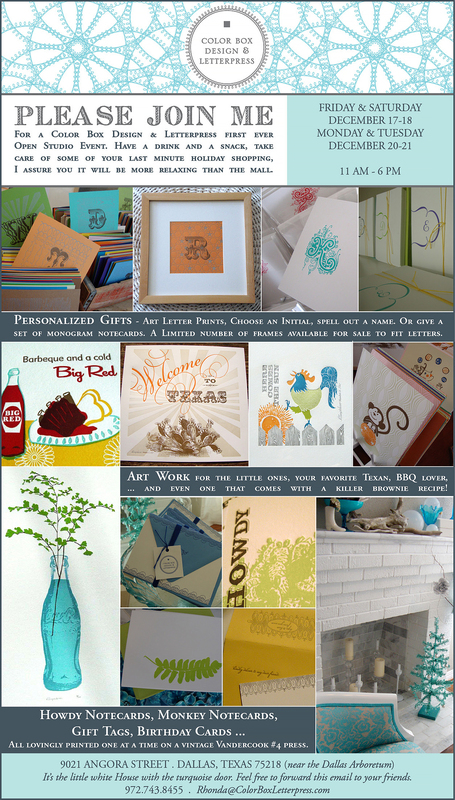 The Color Box Design & Letterpress studio is located at 9021 Angora Street, Dallas, Texas 75218. Just look for a little white house with a turquoise front door. The dates are Friday and Saturday (December 17 & 18) and Monday and Tuesday (December 20 & 21), and the hours are 11 am to 6 pm. Wow! This looks great!! I love original, unusual ‘everythings’. I’m ashamed to say that I’ve never heard about this store…thank you SO much!! Baby Girl, actually it’s her home. It’s a white frame cottage near the Arboretum. I’ve never been there. Rhonda and I have just talked on the phone. She’s been doing some of Katy Trail Animal Hospital’s special letterpress projects. Her blog/website has a link to her online Etsy shop. Previous post Who Will Notice?